class="archive tax-campaign term-debco-premium-potting-mixes term-48 wpb-js-composer js-comp-ver-3.6.12 vc_responsive"
The ultimate potting mix uniquely formulated to achieve amazing results in growing all plant varieties in all pot types. 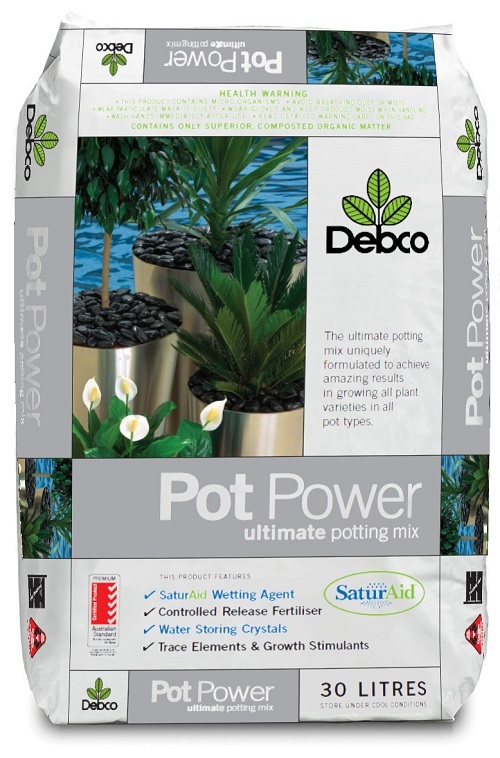 Debco Pot Power Ultimate Potting Mix has been developed from years of experience in the production of potting mixes for professional nursery growers who specialise in the production of most plants sold through nurseries. Controlled release fertiliser promotes fast and continuous growth. Essential trace elements ensure strong healthy plants. SaturAid Granular Wetting Agent gets water directly to the root system. SaturAid Water Storing Crystals increase water holding and reduce the frequency of watering required. Made from quality composted Pine Bark. A long-lasting mix with good drainage and aeration for optimal plant establishment and development. 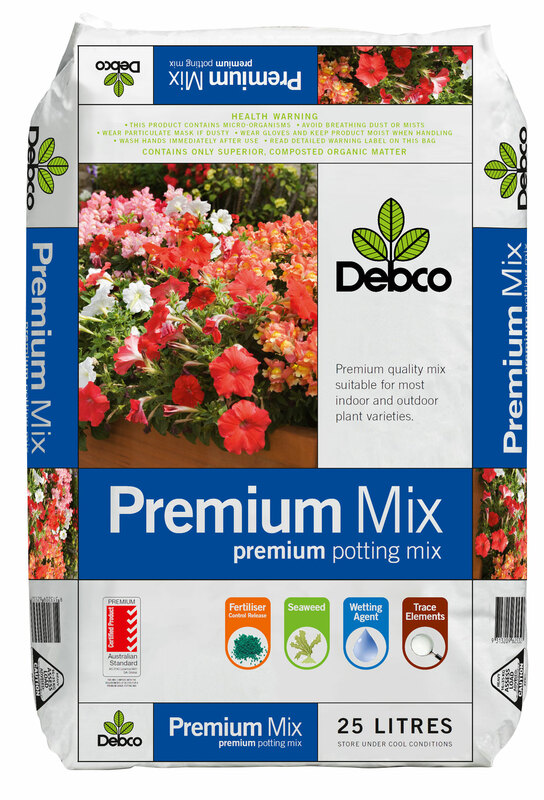 Debco Premium Potting Mix has been developed from years of experience in the production of potting mixes for professional nursery growers who specialise in the production of quality plants sold through garden centres. The formulation has been developed to provide excellent growth of both indoor and outdoor plants including ferns, flowering and foliage plants, trees and shrubs, annuals and perennials. Controlled Release Fertiliser – Distributes nutrients as plants need it. Seaweed Fertiliser – Promotes biological activity in the soil. Wetting Agent – Ensures nutrients get to the root zone. Trace Elements – Micro-nutrients vital to plant growth. 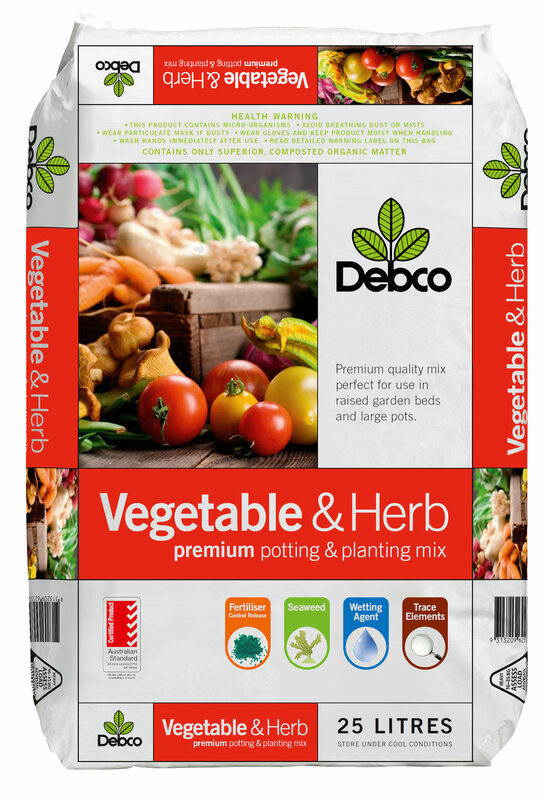 Debco Premium Vegetable & Herb Mix has been developed from years of experience in the production of potting mixes for professionals who specialise in growing vegetables and herbs. This mix can be used for a broad range of plants including vegetables, herbs, and salad greens and is perfect in large pots. It is ideal for constructing new or raised garden beds and adding organic matter to soils. 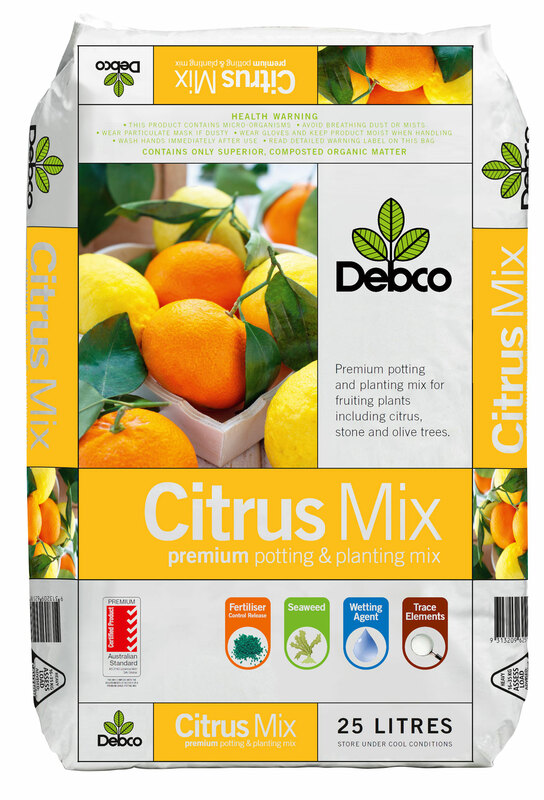 Debco Premium Citrus Mix has been developed from years of experience in the production of potting mixes for professionals who specialise in growing fruit and citrus trees. Debco Citrus Mix is manufactured from the highest quality composted materials with added nutrients to promote healthy plant growth and improved fruit development. The formulation is perfect for growing the broadest range of fruit bearing trees including citrus, stone, and olive and vine trees. Debco Premium Raised Bed Mix is produced to the highest standards and is manufactured from the highest quality composted ingredients with added nutrients to promote strong, healthy plant growth. 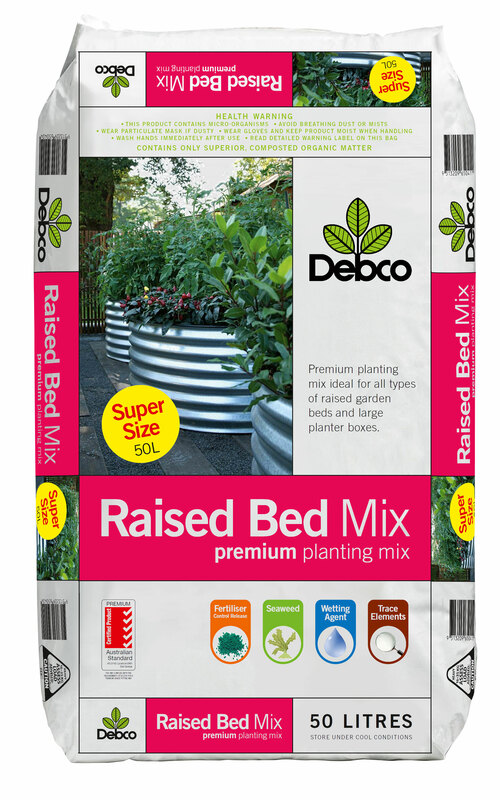 Debco Raised Bed Mix is ideal for constructing new vegetable gardens, raised garden beds or large planter boxes. This mix has been formulated for a broad range of plants including vegetables, herbs and salad greens. 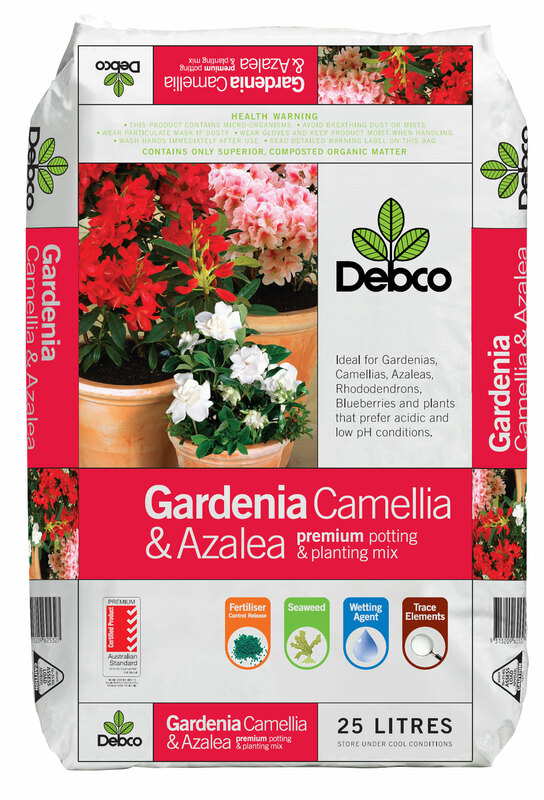 Debco Gardenia, Camellia & Azalea Superior Potting & Planting Mix has been developed from years of experience in the introduction of potting mixes for professional nursery growers who specialise in the production of Gardenias, Camellias, Azaleas and Rhododendrons sold through nurseries. Specific formulation comprised of composted Pine Bark which provides the ideal growing environment for the root systems of Gardenias, Camellias, Azaleas, Rhododendrons and other plant types requiring acidic and low pH conditions. This mix is open and well drained, but also provides adequate water holding so plants will thrive under most growing conditions. 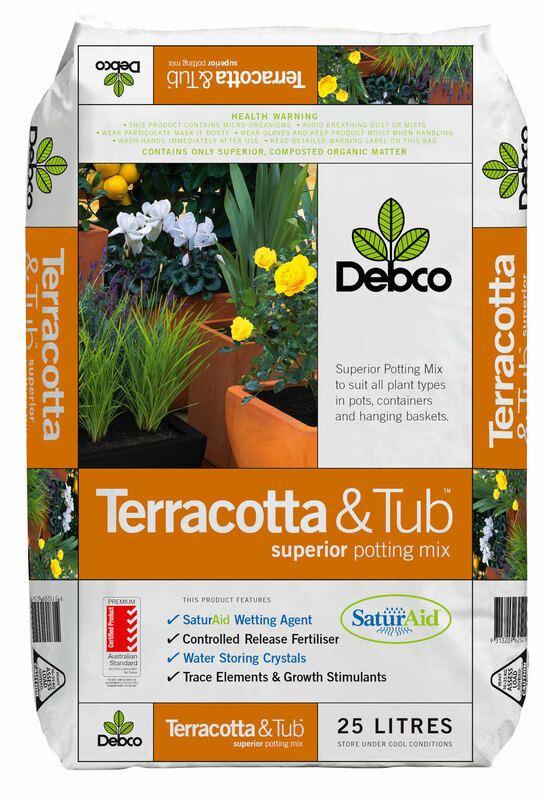 Debco Terracotta & Tub Superior Potting Mix has been developed from years of experience in the production of potting mixes for professional nursery growers who specialise in the production of most plants sold through nurseries. This superior quality potting mix has been designed through careful consideration of the conditions required to grow the broadest range of plants in tough conditions like in terracotta pots and all types of container gardening. Storing Crystals – Increases water holding and reduce the frequency of watering required.